3. Granule Active carbon filter. 4. It can absorb the chlorine, foul smell and other substances in the water. 6. It can eliminate organic chemicals, pesticides, the floating substances, remnant chloride, unpleasant taste, odors and colors as well as heavy metal particles. 8. Its aperture is 0.0001 micron, which ensures the efficient elimination of germs, toxins, heavy metals, salt and other harmful substances. 10. Adjusts water PH value and prevent germs from rebirth, thus improve the water taste. Model: RO-50 1. Working voltage: 220V/50HZ. 2. Acted power: 28W. 3. Raw water pressure: 0.1-0.5Mpa. 4. Pure water output per day: 50 gal. 5. Pressure tank storage: 2 gal. 6. The demand of water temperature: 5-40C. 7. Max TDS of water: 1000mg/L. 8. The degree of purifying water: the rate of taking off salt reaches at 92-99%. 9. Configuration: five grades with pump or without pump. 10. Washing way: auto. 11. N.W. (KGS): 12. 12. G.W. (KGS): 12.8. 13. Unit Meas. (mm): 360x210x460. 14. Packing Meas (mm): 460x270x500. 1. This machine is a wall-mounted purifier, easy to install. 2. 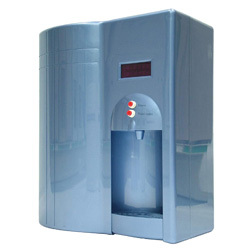 The microcomputer controls whole process of water purification, with the display showing working condition. 3. The electromagnetic valve controls water inflow. When electricity is cut off, water can be fetched from the gooseneck faucet. 4. 4A 24V transformer is inside the machine, with the low voltage ensures safety. 5. Fast tie-ins are adopted to connect machine body and water pipes. 6. Automatically flush the filters for 30 seconds every six working hours.